I never received your confirmation message, please subscribe me. When you sign up for my newsletter, I send an email to the address you specified containing a link you must click. I'll look at why you might miss it. I just signed up for your newsletter but have yet to receive the email containing the confirmation link you indicated I need to click. Could you just add me anyway? Let me explain why, and then look at some of the reasons the confirmation mail might have gone missing – and what you can do about them. There are several common reasons that the email might have gone missing. It landed in your junk mail or spam folder. I know, I go through several hoops not to be labeled a spammer, but this does occasionally happen. Check your spam or junk mail folders a while after subscribing – quite often you’ll find the message there. (Be sure to mark it as “not spam” if you do.) 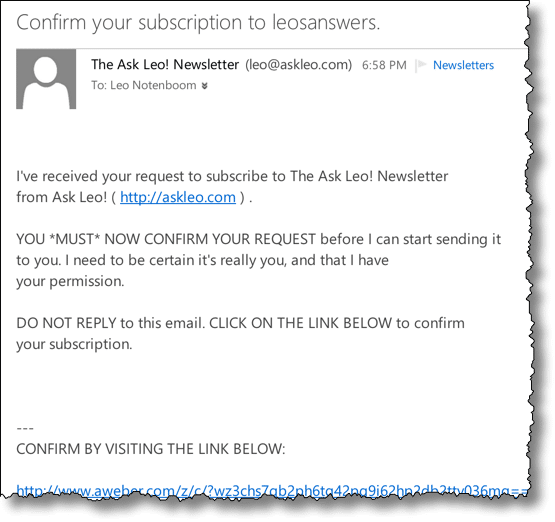 You may consider adding “leo@askleo.com” and “leosanswers@aweber.com” to your address book / contact list or a white list if you have one. A typo in your email address. You might make sure you typed in your email address correctly. You know those forms that make you type it in twice? Surprisingly, a large number of people mistype their own email addresses. Now, I don’t make you do that, so you might want to double check you typed it correctly. A delay in email. Email’s actually not guaranteed to be quick. Even though it usually is pretty darned speedy, the entire email system is built to tolerate delays of several days. There are various reasons that this might happen, including a few very legitimate spam-fighting techniques. The solution? Wait a while. If in a few hours or the next day you still haven’t received the confirmation email, the problem may be elsewhere. Your email provider junked it. Some email providers will prevent mail from even reaching your inbox or junk mail folder, for a variety of reasons. I’m seeing this more frequently with Outlook.com which often blocks email between their own customers for reasons unknown. I have no real solution for this one other than switching to an email provider that will deliver you the email that you’ve asked for. In all cases, it’s perfectly OK to subscribe again using the same address. That should cause the confirmation email to be resent if you haven’t confirmed. I use a technique called “confirmed opt in” or “double opt in” when you sign up for my newsletter. This boils down to my sending you a separate confirmation email containing a link that you must click in order to confirm your subscription. In a word: to combat spam. If I accepted your subscription without confirmation via your email address … well, then anyone could add you whether you wanted on or not! Some “friend” might run around to various web sites and enter your email address to sign you up for all sorts of newsletters and email that you don’t want. If those services don’t confirm then it’s all spam to you. I never, ever, want to be labeled a spammer. Among other things, taking this extra step actually improves the chances that my newsletter will actually be delivered to you – it’s part of building a good reputation as an email sender. Why not just reply to the email? Unfortunately, that would mean that almost any accidental bounce or other reply – even if you replied to say “No!” – would be taken as a “Yes”. The chances are too high that you would be subscribed even though you didn’t want to be. So we require that you click a link in the email. Finally, all this means that I cannot add you manually. Adding people manually would mean I could add people without their consent – a clear violation of anti-spam guidelines. Which means it all comes back to the confirmation email: you’ll need to get it and click on the link therein. Use a different email provider if yours is just discarding the confirmation email. Use the newsletter’s RSS feed to read the newsletter weekly in your RSS reader. Simply visit the website each week. In fact, this URL: https://newsletter.askleo.com/current-newsletter/ will always take you to the most recent newsletter published. « Previous post: Why do I keep getting a newsletter subscribe pop-up on your site?